Plot: A young girl is whisked away to a world of witches, dragons, gods and spirits when her parents stop at a seemingly abandoned amusement park. When her parents are transformed into pigs, it's up to Chihiro to make new friends and believe in herself in order to find the way back to her own world. 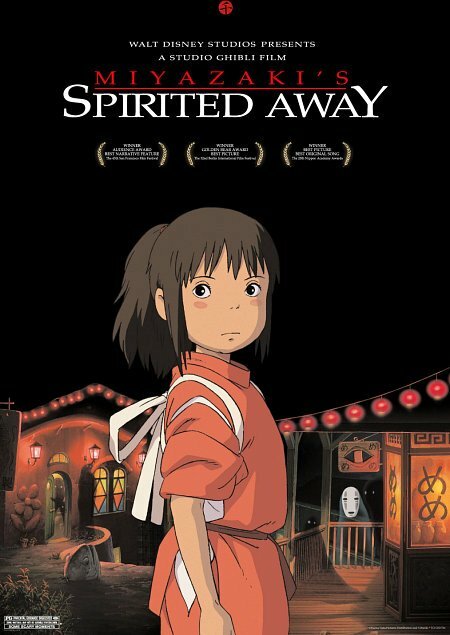 I feel 'Spirited Away' was overhyped for me. I didn't see much present to hold this so high above the other Studio Ghibli films. I very much appreciated the creative/beautiful visuals, child wonder, and unconventional elements. These aspects are expected of all Studio Ghibli's work. It's just more of the same. I didn't connect with the story or characters here. A well done movie, in most regard. I got more out of 'Kiki's Delivery Service'. The animation is great as usual in Hayao Miyazaki's films but this overrated pos has nothing else going for it. I get it. It's a "delightful" blend of Wizard of Oz, It's a Wonderful Life, and Alice in Wonderland. Whatever. My favorite movie from Ghibli studios, it was very fill of fantasies very unique from many others. It makes you think like what if that happened in real life and you don't even know it. I love this movie very much and think every kid should watch this. A young girl is transported to a magical kingdom populated with dragons, spirits and monsters where she must break the spell of its witch-like ruler to rescue her parents and return home. Studio Ghibli's answer to The Wizard Of Oz, Spirited Away is another beautifully crafted fantasy that will enchant children and adults alike. It contains Miyazaki's usual menagerie of strange and wonderful creatures who help and hinder a lost girl in a kind of Japanese homage to Alice In Wonderland. Bizarre and endearing in a way that's peculiar to the Japanese, this film is so beautifully drawn, animated and scored it's difficult to not be drawn into this magical world despite some rather obtuse plotting that may confound younger viewers. Strange and beautiful. No posts have been made on this movie yet. Be the first to start talking about Spirited Away ( Sen to Chihiro no kamikakushi )!